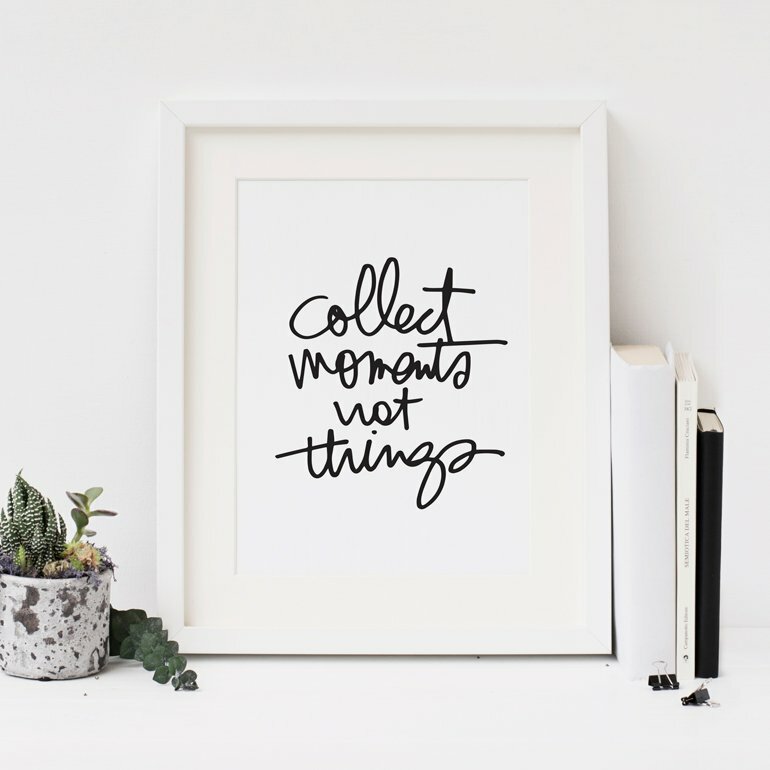 GIVEAWAY | Two (2) people will win a goodie bag containing washi tapes, color blocked wood veneers and enamel products worth $40.00 from Pinkfresh Studio. ABOUT | Pinkfresh Studio is a fresh online shop committed to provide very unique and fun products. They offer their own exclusive range of washi tapes including very unique ombré prints, trendy shaped enamel stickers, brad stickers and fresh press cards in fun colors. 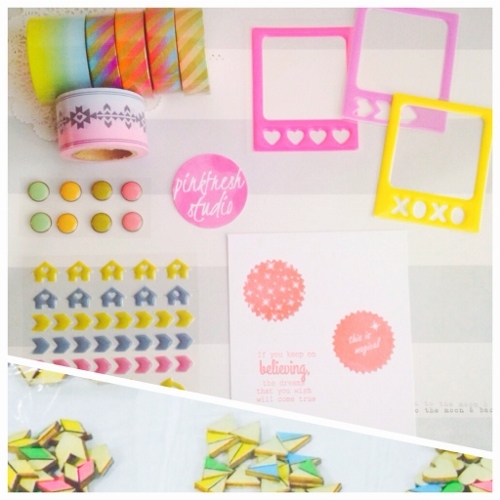 Their ombré print washi tapes with beautiful airmail print and Aztec print are sure to make your paper crafting projects pop.They recently released their 1st ever stamp set called “Delightful tales”. But they don’t stop there, they are about to release their another fun product and it is going to be color blocked wood veneers in 3 different shapes (triangles, hearts and arrows). 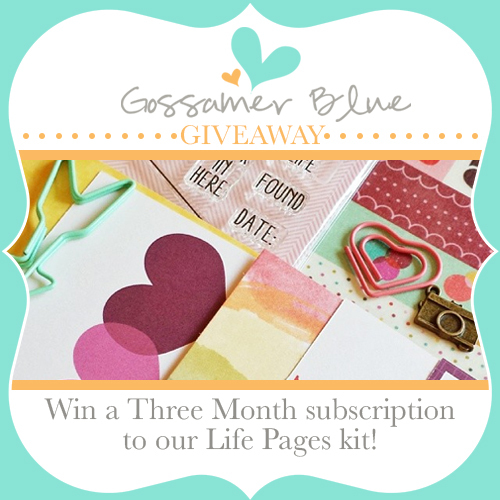 GIVEAWAY | Two (2) people will win a three month Life Pages Kit subscription from Gossamer Blue. The winners will receive the December, January and February kits. The Life Pages kit includes exclusive 3x4 and 4x6 cards, stamps, printables and digital files, along with coordinating embellishments every month. Each card is horizontal and vertical to fit any need. Stamps are manufactured exclusively for Gossamer Blue by Elle's Studio. 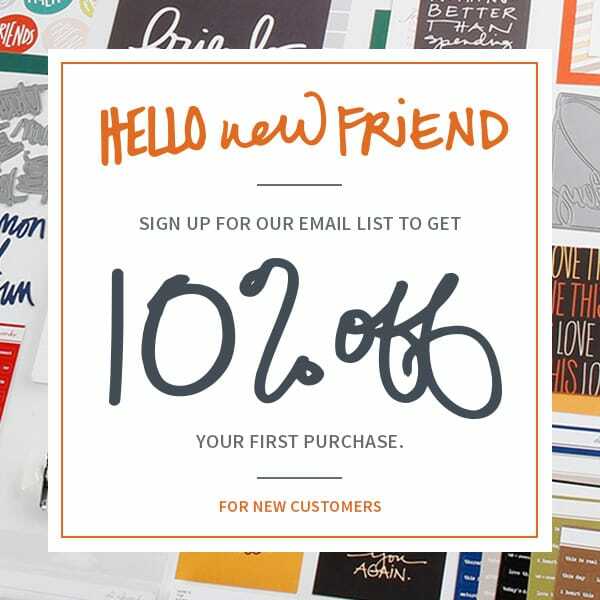 SPECIAL OFFER | Let Gossamer Blue help you achieve your January paper crafting goals! Sign up for either a Life Pages or Main Kit subscription and receive a $20 goodie bag with the January kit. This offer is good while supplies last. ABOUT | Gossamer Blue is a monthly crafts club dedicated to inspiring and motivating memory keepers and crafters alike. Not only is a fabulous box of well-coordinated crafting products shipped to your door each month, you will also find valuable, exclusive products and incentives for inspiring and motivating you all month long. TO BE ENTERED into this giveaway please leave a comment below (if you are reading this post on Facebook please come to my blog to leave a comment). Comments will be closed at 9am Pacific tomorrow morning. The winners will be announced Monday, December 9th. Please be sure to check back or subscribe (click here to get posts delivered to your email box) to see if you are receiving one of the items. These kits look super cute. Would love to win this 3 month subscription. Thanks again Ali for the chance to win such awesome prizes. This is fantastic!! This might be my turn! Thank you for the chance!! As always, the best giveaways on the planet! Wowzers two fantastic giveaways, who wouldn't like to win one! This is absolutely amazing! Happy Holidays! Thanks for the chance to win! I've always wanted to try Gossamer Blue kits but it's not in the budget at the moment. What a great prize - I've been thinking about trying a kit club. Another fantastic give a way!! Wow! Thanks for the chance to win one of these amazing giveaways! Ahhh what calming colors! Thanks for the chance. Thanks again for the opportunity to win great giveaways! Loving the DD posts! thanks for the giveaway! Thanks Ali for the chance to win GREAT prizes! LOve these products. Thanks for a chance to win. I love the bright colors and the PL cards will come in handy as I revamp my system for 2014. Thanks for the chance! Nice, as allways!!! Very bright colors! Positive! Great giveaways ~ thank you for the chance to win!! Another set of fantastic giveaways! Thanks so much to you and all the sponsors! I'll jump up and down with pure JOY if I am one of the lucky winners!